Arizona Senate candidates Martha McSally and Kyrsten Sinema are tied in a new poll of likely voters released by Fox News on Wednesday evening. 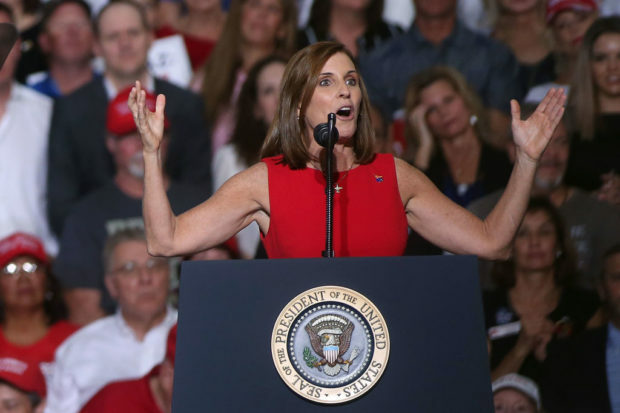 The poll revealed that 46 percent of likely voters favor the Republican candidate Martha McSally while the same percentage like the Democratic candidate, Kyrsten Sinema. The remaining eight percent either said that they “don’t know” or that they prefer another candidate. It also showed that 88 percent of likely voters that favor both Sinema and McSally individually have their minds made up. Only eleven percent of people who supported each candidate may change their mind. The numbers barely change when looking at the registered voters that were surveyed in this poll, with Sinema only up one point. This poll was not substantially different than Fox News’ two previous polls on this race. Sinema was up three points and two points respectively in those prior polls, with Sinema’s lead dwindling as each took place. Sinema’s campaign has faced multiple challenges during her campaign. Two different damaging videos resurfaced recently. Back in 2006 she referred to stay-at-home mothers as “leeches” and she said she didn’t care if Americans went to join the Taliban during a radio interview back in 2003. McSally, who spent time overseas after 9/11, has demanded Cinema apologize for that comment. Sinema also called Arizona the “meth lab of Democracy” while speaking at Netroots Nation, a liberal conference that took place in August. The most recent poll was conducted by Anderson Robbins Research (D) and Shaw & Company Research (R). 710 registered voters and 643 likely voters were contacted and surveyed between October 27-29. There is a margin of error of 3.5 percent.